SpringBoard 2018 – The most awaited math contest in the USA and Canada kicks off March 5, 2018. Designed to help every classroom win, SpringBoard is a nationwide contest organized for K-5 math classrooms every year. Building on last years’ success (over 150,000 students participated in 2017), SpringBoard 2018 would have a wider reach and more rewards than ever before. SpringBoard will run for 10 weeks from March 5 to May 13, 2018. Weekly rewards would be unlocked as soon as the classroom achieves weekly practice goals, plus bonus rewards for extra achievement. This is a great way to keep your students engaged and motivate them to practice consistently. Grand prizes would be awarded to 3 top performing classrooms on May 18th. 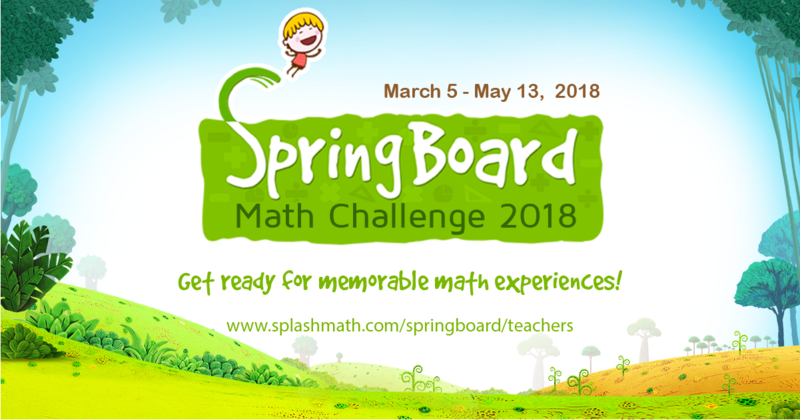 All elementary math classrooms in USA and Canada can participate in SpringBoard 2018. Existing Splash Math users can enroll directly from their dashboard. Teachers who do not have Splash Math account can sign up using the link below, and receive full access to Splash Math until June 2018. Enrollments close on March 2nd. Sign-up early and pep-up students for the 10 weeks of math fun. Spring is the best time to master math skills, build confidence for the final exams, and end the school year on a math high. SpringBoard helps schools achieve just that, but with a flair. Don’t miss out! Regular SpringBoard 2018 updates on Facebook and Twitter (@splashmath).